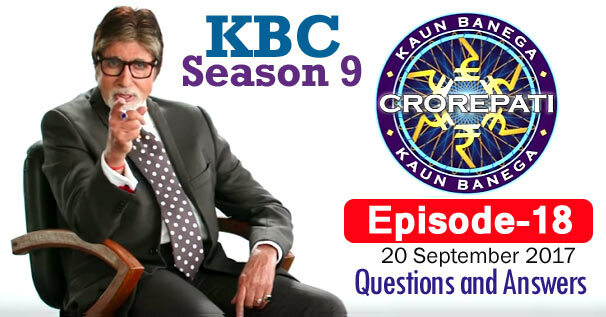 KBC Season 9 Episode 18 Questions and Answers: The eighteen episode of Season 9 of Kaun Banega Crorepati (KBC) was telecast on 20th September 2017. In which Amitabh Bachchan had asked contestants 14 questions of General Knowledge. The correct answer to all the questions is given below each question. By reading these questions, you can prepare yourself for the next KBC Season 10 of Kaun Banega Crorepati. Because by reading these questions, you will understand what kind of questions asks Amitabh Bachchan in KBC. These all general knowledge questions will be helpful to for you various Competitive Examinations and Interviews besides KBC. Remember, the answer to some question may be in accordance with that time, while the answer to those question may differ according to the present time. 1. Which is the only Test playing nation that India has never beaten in T20 International ? 2. Who among these was the first to become a chief minister, before any of the other three ? 4. Which one of the following would be your 'bahurani' ? 5. Which of these gods is also known as 'baabsuriwaale' ? 6. Which of these is a multiplex chain in India ? 7. Which of these animals appears in the logo of the 'Make in India' campaign ? 8. On which actor is this song picturised ? 9. An athlete generally runs the fastest in which of these Olympic running events ? 10. Which of these rivers flows into the Arabian Sea ? 13. In the process of evaporation, which of these changes into vapour ? 14. On which of these social media apps does one have the option of going live with video ?